Our Every Drop Adds Up campaign builds on the idea that people coming together for a common goal can make the impossible happen, just as it did four summers ago when the ALS Ice Bucket Challenge soaked the world. Every person helped, research project funded, story shared, discovery made, piece of legislation passed, and dollar raised it all adds up! ALS affects everyone in the family even kids. In a new video, real families talk about the impact that a loved one having ALS has on young people how the disease can be scary and confusing for them and how kids can inspire us all to keep fighting. Watch it and share with your friends and family. Across the country, kids are fighting ALS in their own way. Rebecca Wetzel in New Jersey, whose grandfather and father both died of ALS, and who has a 50 percent chance of having the genetic mutation that causes ALS, created the Iced Tea Challenge with her two young daughters to raise money for ALS research. 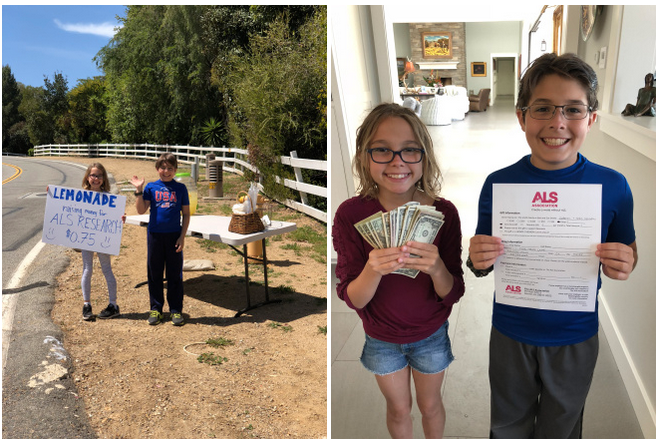 Kelley Delgado’s kids, Gabriel and Sara, spent an entire day selling lemonade outside their California home, intent on making a difference by raising money to find a cure for ALS. Their grandmother had passed away from the disease when she was just 62 years old. Sophie Rubin, a Maryland seventh grader, was inspired to fight ALS because of her close relationship with her grandmother. “Nanny” was diagnosed with ALS in 2017 and passed away earlier this year. Sophie helped to raise over $10,000 through her “Nanny’s Nation” One Dollar Difference fundraiser. Our Every Drop Adds Up campaign builds on the idea that people coming together for a common goal can make the impossible happen, just as it did four summers ago when the ALS Ice Bucket Challenge soaked the world. Every person helped, research project funded, story shared, discovery made, piece of legislation passed, and auction bid placed it all adds up! For people living with ALS and their caregivers and family, every day adds up. ALS is a journey that begins months, even years, before a diagnosis. Because there’s no definitive test for ALS, doctors must run through a battery of tests, ruling out other potential syndromes, conditions, and diseases before making a diagnosis of ALS. It’s a journey that, for many people diagnosed with ALS, continues through the five-month waiting period they qualify for Social Security Disability Insurance. It’s a journey with many difficult days spent dealing with the loss of motor functions. "[ALS] is a disease that is challenging every day. Every day I wake up not knowing what’s going to happen. You take for granted every day what you do." It’s a journey that also has good days, as families affected by ALS continue to live each day and find moments of joy. Please watch this impactful video and then share it with your friends and family to help raise awareness of ALS. Dr. Rahul Desikan is incredible. He’s a prominent researcher of neurodegenerative diseases, including ALS, as well as a loyal husband, father, son, and friend. And on February 17, 2017, in a cruel twist of fate, he became a person with ALS. Dr. Desikan entered the research and medical field at Boston University in Massachusetts, obtaining both his M.D. and Ph.D. He then completed his diagnostic radiology residency at University of California, San Diego (UCSD) before moving on to University of California, San Francisco (UCSF) for his neuroradiology fellowship. In the fall of 2016, after years of hard work, he was offered an assistant professorship, along with his own research lab, at UCSF. Dr. Desikan met his wife, Dr. Maya Vijayaraghavan, in Boston, during her fourth year of medical school. They celebrated their 10th wedding anniversary with their two young sons earlier this year. Dr. Desikan’s passion for understanding the cause of neurodegenerative diseases, such as Alzheimer’s disease, Parkinson’s disease, and ALS, was eminent. His work focuses on using a “big data” approach to explore huge datasets using novel data mining and statistics to identify a person’s risk for disease. Soon after his appointment to assistant professor, Dr. Desikan began showing early symptoms of ALS changes in his voice, muscle twitches in his left arm, and weakness in his fingers. Five months later, at the age of 38, he received his diagnosis at the ALS Treatment and Research Center at UCSF, one of the Association’s Certified Treatment Centers of Excellence. Dr. Desikan is determined not to let ALS define him. Last month, his work demonstrating a selective genetic overlap between ALS and frontotemporal dementia (FTD) was published in JAMA Neurology. He and his colleagues used a big data approach to uncover two new ALS risk factor genes, BNIP1 and MAPT H1, which represent new ALS therapeutic targets. Those same colleagues and others including people early in their careers and established faculty regularly visit Dr. Desikan’s home to discuss and troubleshoot their ideas. And he’s working hard toward his main goal: a better understanding of the causes of ALS that will, ultimately, lead to effective treatments and a cure. Unfortunately, he’s racing against a clock that’s powered by ALS. Yet, his work continues, along with his pursuit of hobbies, like honing his DJ skills at parties he throws for his friends. You can learn more about Dr. Desikan’s research here and here. Our Every Drop Adds Up campaign builds on the idea that people coming together for a common goal can make the impossible happen, just as it did four summers ago when the ALS Ice Bucket Challenge soaked the world. Every person helped, research project funded, discovery made, auction bid placed, piece of legislation passed, mile walked, and story shared it all adds up! Our fall Walk to Defeat ALS® season is fast approaching! We talked to people including Renee Zellweger about why they come together every year to fight back against ALS. Share this video with your friends and family and let them know that Every Mile Adds Up! And, if you haven’t already, please join a Walk to Defeat ALS event near you and make an impact for people diagnosed with ALS in your own community. There’s no known cause or cure for ALS, but together, we’re working to change that. After Stacy Crowder was diagnosed with ALS, he gathered his friends and family to participate in a nearby Walk to Defeat ALS. While he says he didn’t expect to have much of an impact, his team raised more than $30,000! This year, we launched an exciting new aspect to the Walk. It’s called “UNLOCK ALS” and it’s symbolic of the need to unlock the mysteries of ALS and a way to recognize the real reasons people across the country Walk to Defeat ALS. Each Walk participant selects one of four colors to represent their connection to ALS, receives a branded key, and joins in a meaningful UNLOCK ALS opening ceremony on Walk day. Whether you’re new to the Walk or a long-time participant, your commitment to the fight against ALS helps fund compassionate care, nationwide advocacy, and cutting-edge research. Every Mile Adds Up! August marks a month-long opportunity to raise awareness and move closer to a world without ALS. Our Every Drop Adds Up campaign builds on the idea that people coming together for a common goal can make the impossible happen, just as it did four summers ago when the ALS Ice Bucket Challenge soaked the world. Every person helped, every research project funded, every discovery made, every piece of legislation passed, and every story shared it all adds up! Sunny Brous Erasmus is a wife, daughter, “dog mama,” sister, aunt, and friend. She’s like her name strong, full of life, and a very bright light. Her mantra is “no apologies, no excuses, no regrets,” which helps explain why she considers Dr. Miranda Bailey (“Grey’s Anatomy”), kind of bossy and always in-charge, her soul sister. Sunny needs all that moxie to fight ALS. A diagnosis of the disease hit her like a ton of bricks right before her 28th birthday. Dr. Maria Phillip at Texas Neurology in Dallas delivered the shocking news on January 20, 2015. More than three years later, Sunny is still making the most of each day with her husband, Kenneth, and their chocolate Labrador Retriever, Baloo Bear. They share a home in Fort Worth, Texas. Sunny has embraced her walking stick, “Phil,” named after Phil Dunphy from “Modern Family,” and her scooter, “Garth,” named after Garth Brooks. She’s on round 12 of Radicava infusions with she takes through her port, “Paula” with no obvious signs of additional progression. It’s what she calls a “no news is good news” situation. Late last year, she was forced to leave her beloved job as director of development and events for a nonprofit, but she and Kenneth have looked on the bright side (pun intended). They’re using what Sunny calls her “retirement” as an opportunity to check things off their bucket lists. Sunny had a list of 30 things she wanted to do and experience before her 30th birthday. The list took longer to compete than the month she had allocated, but she accomplished some major items, like test-driving a Porsche, throwing out the first pitch as a Texas Rangers game, and being on the cover of a magazine. She and Kenneth are lucky to have a wonderful support system a close-knit family, many friends, and the ALS community, including The ALS Association Texas Chapter. Check out Sunny’s story about how ALS impacts her life. We think you’ll find her as inspiring as we do. She’s truly #SunnyStrong. You can follow Sunny on Facebook here and read her blog here. Every Story Adds Up! August begins today, marking a month-long opportunity to raise awareness and support for the fight against ALS. Four summers ago, the ALS Ice Bucket Challenge soaked the world, but we continue to fight for a world without ALS. In that time, The ALS Association has committed more than $96 million to our mission, including more than $84 million to research. There are many ways for you to help spread the word and raise money to keep the momentum going. Bid on an auction. Throughout the month, we will host an online auction featuring sports, entertainment, and luxury items and experiences. Each week, we’ll be posting auction items ranging from a weekend stay in Wine Country to a private batting practice session with an MLB all-star. Visit alsauction.org to view and bid on one-of-a-kind experiences aimed to generate significant funds to support the fight against ALS. Every Bid Adds Up! Share the stories from our community. Throughout the month, we will also be featuring stories of people living with ALS and their families. Check in here throughout the month to read those stories, and then share them on social media. Every Story Adds Up! Pick up a PopSocket. This summer, PopSockets, the maker of popular smartphone attachments, is donating 10 percent of the proceeds from all online purchases to The ALS Association. Later this month, we’ll share the story about the connection between these two organizations. This month (and through September 30), Every Pop Adds Up! Host a fundraiser. One thing that has become clear in the years since the Ice Bucket Challenge: August is for raising funds for the fight against this terrible disease. Create a personal fundraiser on our One Dollar Difference platform. Every Fundraiser Adds Up! As the Ice Bucket Challenge proved, small actions of a few can have a major impact. Or, as we like to put it, Every Drop Adds Up!